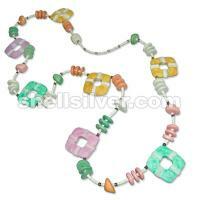 Endless necklace in 3-4coco heishe super bleach, 3-4 mm clear beads in assorted colors,15 mm wood pukalet super bleach whte, ornge, green & pink,wood nuggets ornge,pink,super bleach whte & green,36mm wood square w/painting green,yellow & pink. 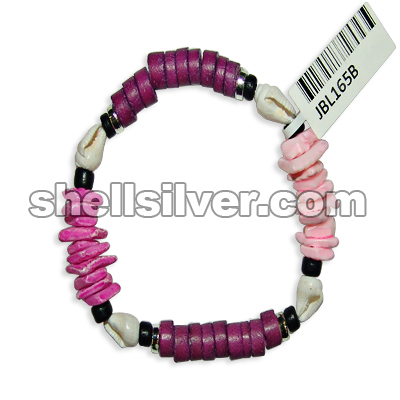 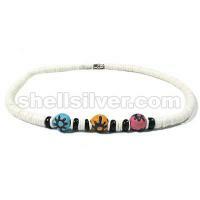 Bracelet 7.5 inches in 4-5 mm coco pukalet black, 6 mm silver coated flat pukalet, 7-8 mm coco heishe purple, nasa shell white and white rose light pink and fuchsia pink. 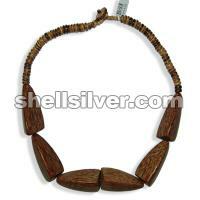 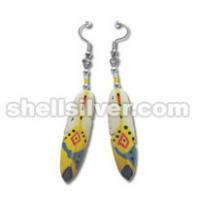 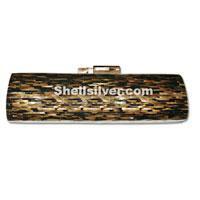 Necklace 21 inches in 8 mm coco pukalet tiger and palm wood triangle 3 sides 23x50 mm. 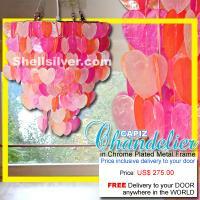 3 layers Capiz chips orange, pink and light orange heart design, 370 pcs. 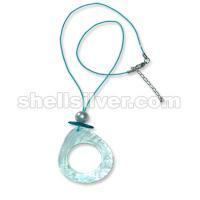 50mm capiz heart chips, 14.5 inches base to bottom, head frame 12 inches diameter.